An accident left her a double amputee. But with the help of cutting-edge surgery—and a fighting spirit—Clara Gardner ’16 is up on her own two feet again. Two months, several surgeries and many hours of grueling rehab later, she was back at Northampton High School to complete her senior year. She’d considered taking a year off before college, but ultimately she and her family felt the stability of college life, specifically at a college near her health-care team, was the best option for moving forward. A year after losing her legs, Gardner entered Smith as a member of the class of 2013. Gardner’s enthusiasm brightens the exercise class she leads at an assisted-living center. Gardner decided to take a leave from Smith so she could devote herself to gaining proficiency with her prosthetics. 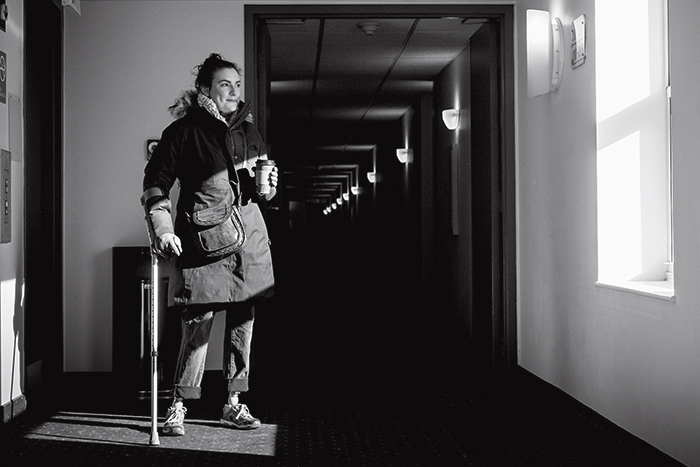 “I was like, ‘I’m not coming back to Smith till I get up and walking,’” she remembers. Around that time she began meeting war veterans who were amputees. She attended a prosthetics boot camp, and she embraced something she had avoided before: spending time with other amputees who could help her come to terms with what life had dealt her. She took advantage of improvements in prosthetic technology that were making it easier to walk, though it still took a lot of time, effort and singular focus. Gardner began taking classes at Smith again, although numerous medical appointments and the intensity of her disability slowed her progress. When she finished in January 2016, she planned to walk at her Commencement the following May. But life handed her another twist: She had learned of a new surgical procedure that promised to reduce her pain and drastically reduce the amount of time she spent in a wheelchair. The only hitch was she would have to go to Australia to have it done. The cost, however, was prohibitive for a 6.5-hour operation that would not be covered by insurance. Plus, there was travel to and from Australia, and six weeks there working with a team of physical therapists twice daily after surgery. All told, the cost was close to $100,000. Gardner and her family launched an online fundraising effort that drew donations from the Northampton community and from many Smith alumnae, raising $63,000, including $10,000 from an anonymous donor. Osseointegration is not without controversy. Some people object to the gruesome nature of drilling a rod into the thighbone. And although risks have lessened in the 20-plus years it’s been performed, the potential remains for serious infection. Further, some fear that amputees will break a femur bone if they fall. For Gardner, both surgery and recovery were a success. Walking is easier, she says, and she can feel her femur bones getting stronger and stronger. Nevertheless, every day she endures pain. “I’m still an amputee, so there are going to be challenges other people don’t have to deal with, but this is such a huge improvement,” she says. On a blustery November evening, Gardner and Rogers are sitting together in their living room on a white couch, candles burning nearby, talking about their “normal life.” For both, this is their longest relationship. “I don’t know how we get along so well, I really don’t. I’m shocked,” Gardner says, prompting laughter from both. And they’re looking ahead. In mid-December, they moved into a downtown Northampton apartment with better accessibility and no stairs. “I love being able to walk everywhere,” Gardner says. Rogers, who is a hospital orderly, is aiming to become an occupational therapist. Gardner is considering graduate school in social work, possibly pursuing a specialty in geriatrics. Documentary filmmaker Augusta Rose witnessed how her longtime friend Clara Gardner ’16 dealt with the aftermath of losing her legs in 2008 in a tragic car accident. And Rose rooted for her as Gardner learned to navigate her life as a double amputee. As a filmmaker, Rose saw a subject with a lot of heart. The two women have known each other since middle school and have been in each other’s lives ever since. 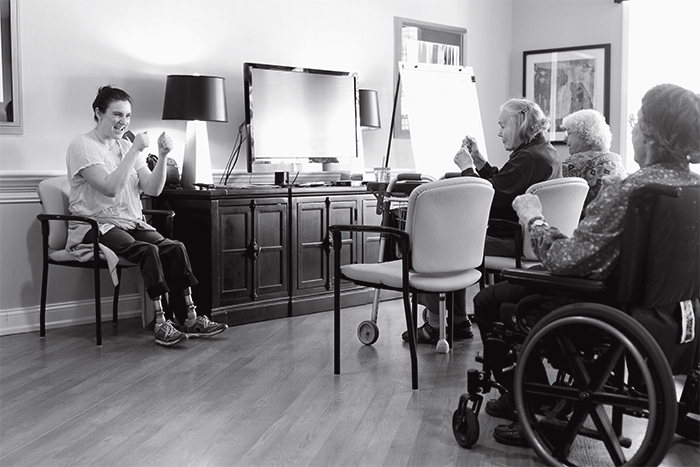 Rose had previously created a photo series documenting how Gardner learned to use her socket prosthetics. Their friendship adds a level of authenticity. In one scene, Rose sits with a groggy Gardner after surgery, the two holding hands; in another, the two friends are on a bed together as Gardner talks about her pain. “To quote Clara, ‘You don’t know how strong you can be until you are forced to be,’” Rose says. Laurie Loisel is a freelance writer in Northampton.